Experience country living with the 4 bedroom house with oak hardwood flooring, basically equipped kitchen, and 2 full baths with ceramic tile flooring. First floor bedroom and bath for those that might have trouble climbing stairs. The living room has a brick fireplace with floor to ceiling built-ins with large windows on the other three walls. The back of the room leads into a 3 season sun room. 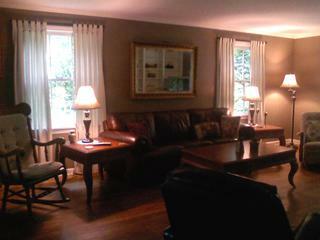 Finished Family room in the basement with very large brick fireplace. The Ellis Guest House was built in 1954 by William Ellis. The land was once the gardens of the 3200 Farnam Estate. The house was one of the first to be built near Farnam Manor, which stood alone for over 100 years. Before he died, Bill Ellis researched the Farnam Estate and wrote a book to pass on the legends and lore of the Farnam Estate. My cousin and I were looking for a place to meet for a family reunion. We were looking for a comfortable place to just hang with one another. We found it at the Ellis Guest House. It was a perfect spot for the 7 of us. Not only was it country and comfortable, but major roads near by made travel to Cleveland and Akron very easy. A lovely place! 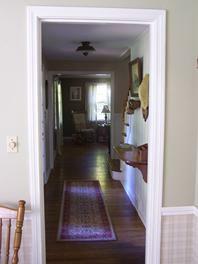 The charming farm house was a delight for our children, grandchildren and for us. The rooms were spacious and clean. The lighted night walks to the brook was fun. The fire pit and wood was great for story time and memories. The daffodils and magnolia tree were in full bloom and the permaculture natural foliage on the walks were great. We took a tour of the Farnham home and learned a lot of history about the farm and foundation. 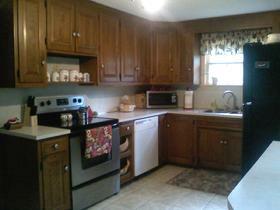 The house is centrally located with minutes away from interstate transport. We enjoyed a hike to Brandywine waterfall. The manager was helpful for any questions we had. Pierogi of Cleveland was close by and a grocery store within minutes from the house. Cozy Home - Great for Groups! Rented this house a few months back when I was in the area for a family reunion. We stayed there with a few others also in from out of town. Is it a 5 star hotel? No. But….It is spacious and clean and it only took 24 hours and we were all rather charmed with this old country place. Parts of the home (mainly the ground floor) have been nicely renovated and cleaned up more than others. I spoke to the owner at length about some of issues that we found (also noted in a previous review) and Kathleen welcomed the feedback and was quick to address these problems. She also enlightened me to the history of the house and how it’s been a proud work in progress for them and that upgrades are ongoing. The bottom line is, this IS a very old farmhouse and if you like old houses and the character that comes with them, you’ll enjoy this place. For a group vacation such as ours, we really did appreciate having a home to rent over separate hotel rooms. It allowed family from distant places to hang out, utilize a common kitchen and we had plenty of room to stretch out and relax between the house, the porches and the yard. I may be back in Ohio for a wedding next year. If so, I would definitely look into this house again. We appreciated the cleanliness. Thank you for a wonderful stay! My husband and I and our dog enjoyed our stay here. I’ve always wanted to live in a house like this, an aging Cape Cod with large, sunny rooms, hardwood floors, built-in bookcases, a well-shaded, spacious lawn. The house is perfect for larger gatherings: the living room has comfortable seating for 8 or more people, and there are many private nooks for conversation and getting away from the crowd. My favorite spot was the small porch off the kitchen. Our aged, arthritic dog liked the fact that there was only one step up into the house from the front porch. The property is just large enough for morning and evening walks with the dog, but the real selling point of this rental is its proximity to the Cuyahoga Valley National Park and the Brecksville Reservation of the Cleveland Metroparks with their miles of trails, lakes, and picnic areas, all just 8-10 minutes away. Don’t miss Heinen’s grocery in Brecksville for carryout prepared food and a fabulous wine selection and the art galleries and small shops in Peninsula. All in all, this rental has a perfect location close to major highways and the great attractions in Cleveland as well as the charming countryside of Ohio’s Western Reserve. Rented for a "Gals Getaway". This is an excellent location - great shopping within 1/2 hour away - close to CNP and all it has to offer. Very homey and comfortable! Our group of cousins loves to get out and do things during the day, but then have a place we can just relax together and reminisce. This home fit the bill perfectly! hat a great house! It's set in a beautiful location surrounded by trees and flowers. The house has everything you need, so all you have to do is unpack and you are set. We had a nice stay and the owners, Kathy and Tim, were very friendly and professional. We would definitely stay here again! "Thank you for allowing us to use your wonderful home and land. It was amazing!